The Douglas-Fir Tree is from the evergreen conifer classification and is not actually a true fir tree at all. It grows in areas of Western North America, specifically in the temperate rainforest zones throughout Oregon, California, and Washington. It can also be found in parts of Mexico. It thrives when elevations are above 6,000 feet (1,830 meters), conditions are sunny, and soil is moist (but does not do well in regions where there is poor drainage or dense soil. The tree gets its name from botanist, David Douglas, who was the first to successfully grow the tree in England. 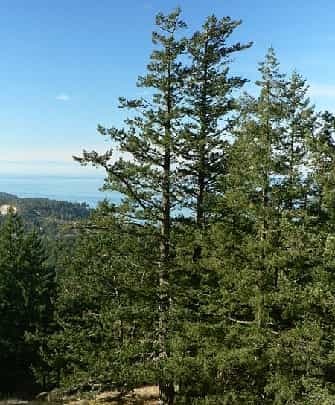 Read the below facts and you'll find information on why this tree is so valued and what it is used for as well as other interesting information on the Douglas-fir Tree. The lifespan of a Douglas-Fir Tree is anywhere from 500 to 1,000 years. The Douglas-Fir is also known as the Douglas Spruce or the Oregon Pine tree. Many animals in the temperate rainforest feed off of the needles of the tree. Numerous species of birds as well as rabbits, elk, deer, beaver, and chipmunks rely on the needles as a staple of their diet. After scraping off the bark, bears will eat the sap layer of the tree. Because of the massive size of the tree, the wood or lumber from the tree is highly valued. It is used for lumber and plywood and also makes excellent wood fuel. Clay can be dangerous to the health of a Douglas-Fir. Because it contains a lot of moisture, it can cause the tree's roots to rot. Because of the thick bark of mature Douglas-Fir trees, it is often able to survive forest fires with the only damage being blackened bark. Douglas-Fir Trees are a useful aid in preventing soil erosion when grown in the right spots. The Douglas-Fir is sometimes used in commercial landscape designs, but is too big of a tree for residential landscaping. In many parts of the United States, Douglas-Fir trees are used as Christmas Trees. The main pests that the Douglas-Fir is susceptible to include aphids, scale beetles and bark beetles. Douglas-Firs are very large trees. When cultivated, they can reach heights of 60 feet (18.2 meters) tall and up to 25 feet (7.6 meters) wide. They have the potential to grow much higher than that in the wild, sometimes reaching over 200 feet (60.9 meters) tall. The tan colored, forked cones are between 1 and 3 inches long and begin as green in color but turn grey as they age. AS the cone matures, it has a more bristled appearance. The tree has a tall, pyramid shape that resembles a Spruce tree, but is broader. The pyramid is particularly noticeable in young trees and becomes less prominent as the tree ages. Douglas-firs have flat, pointed needles that are greenish-yellow in color. The needles are quite fragrant, especially when crushed. The bark, which gets thicker over time, is a brownish-red color and as the tree ages, it develops dark brown ridges or grooves.